My wife has been telling me about this Wanton Mee stall at Tanjong Pagar Plaza so on a fine weekday afternoon I made my way down to check out Teck Kee Wanton Mee which my wife has been raving about. We arrived slightly after the lunch hour which was a blessing as I needed not queue for my food and even the stall lady offered to deliver my food to my table. My wife ordered the Wanton Mee ($3) which comes with a couple of char siew and a bowl of soup with 2 wantons inside. The char siew was dry and the wanton was quite pedestrian. However, what stood out was the springy, semi firm noodles with a nice bite. 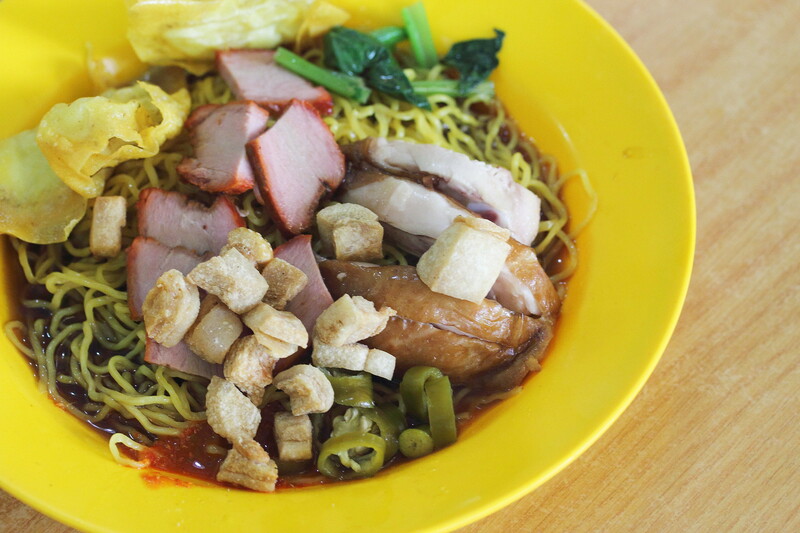 The texture is sort of a in between of the maggie mee noodle and Hong Kong style wanton mee noodle. 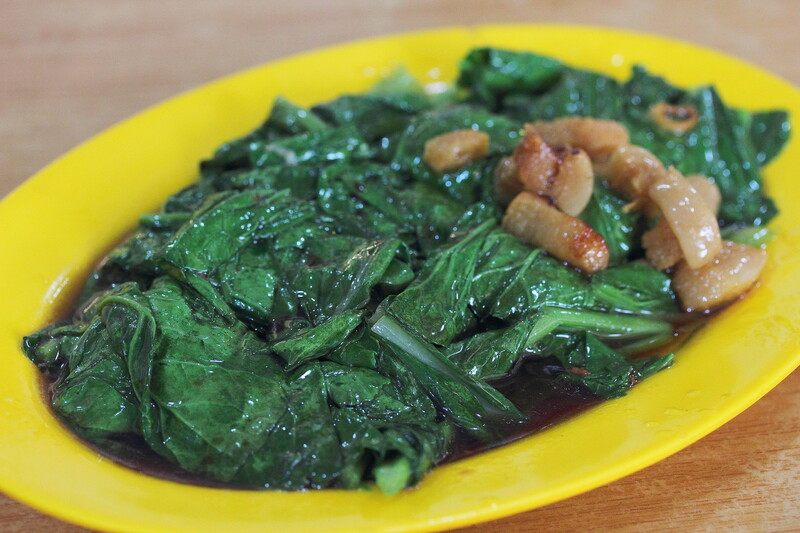 The sauce also remembered me of Kok Kee, which I thought was pretty similar. The other bonus is the free flow pork lard. I went for the Signature Wanton Mee ($4) which has additional fried dumpling and soy sauce chicken. I felt that the tender soy sauce chicken fair much better than the char siew which was on the dry side. The flavour was also there. The fried dumpling was also worth mentioning. Unlike the using minced pork stuffing, these are stuffed with fish paste. We also ordered a plate of Vegetable ($3) to go along with our lunch. We wanted to have a cleaner diet but the greens was unfortunately on the oily side. 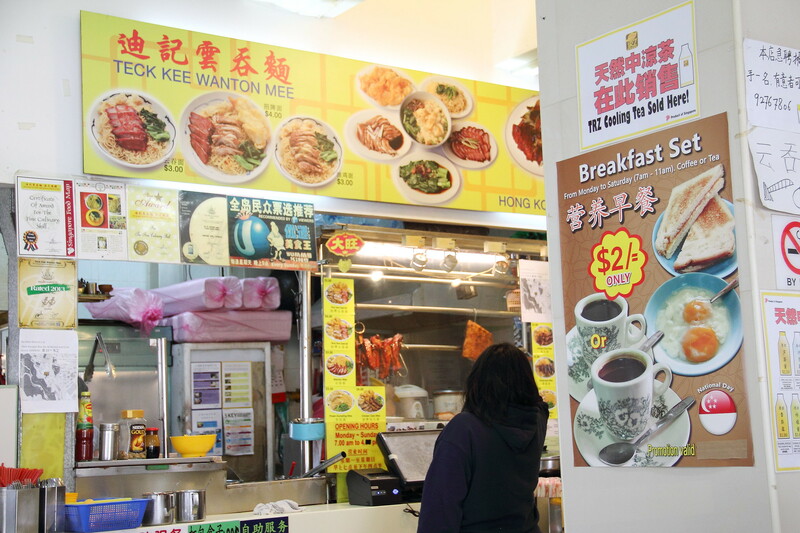 After checking out Teck Kee Wanton Mee, I can understand why it has a group of fans. The noodle is definitely the star of the dish. 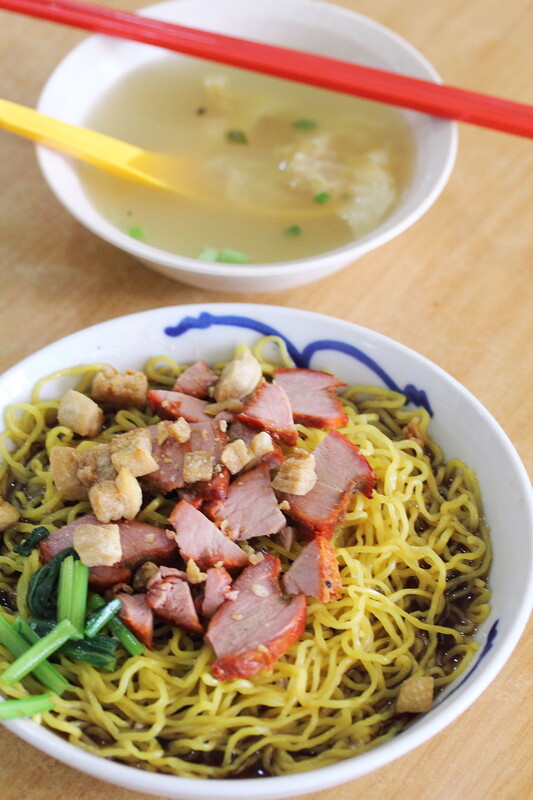 If they are willing to spend more effort on the roast and wanton, I am sure it has the potential to become one of the best wanton mee in town. No wonder the queue is perpetually long, till now I haven't tried it! Thanks for the writeup haha, I'll go earlier or later to avoid the lunchtime crowd then..
Let me know how you find it when you tried it. I had it a couple of days ago.... hmm found it so-so only... I don't know if it's because it was rush hour? the colleague I lunched with that day have fixed lunchtime between 1-2pm (yes, the worst lunchtime in CBD area). I think you are correct, I find it nice but not wow. The noodle texture is quite good in my opinion. I also prefer the soy chicken over the char siew. You are welcome. Hope u like it.